We combined that with another piece of information you gave us from a recent survey on how often the average player worked out each week, not counting playing basketball. So we combined these together to try and help players improve their basketball training by showing some very specific exercises that you can add on to the workouts you are already doing*. We enlisted the services of athletic training expert, Jason Ellis, co-founder of Rock and Armor. Jason is a professional trainer and a former professional basketball player that has played in the NBA D-League and overseas. Jason will provide a new exercise each week that is intended to be added to your workouts you are already doing and won't require any special equipment or assistance. And don't forget that BAM Jam presented by Treasure Valley Ford Stores is March 21-22. Be sure to register by March 8 to get in. With great lateral quickness you are going to be able to create more open shots off the dribble, get more rebounds, become a feared defender and get to more loose balls. Below is a short video that explains the exercise and gives an example of how to do it. *The exercise requires three small markers (could be cones, a hat or pretty much anything). Place the markers 5 yards apart on a flat surface. Start at the middle marker in an athletic stance, on balance and on the balls of your feet. Start by picking one direction (left or right) and doing a defensive shuffle to the outside marker. Touch the marker with your hand and then plant your outside foot, open your hips and sprint back to the center marker. Repeat the defensive shuffle back to that cone. Again, touch the outside marker with your hand, plant your outside foot, rotate your hips and now sprint past the center marker all the way to the other outside marker. This is one rep.
Repeat 5 times in the same direction. Then do the exercise in the other direction 5 times. There are 10 total reps and it will take you about :10-:15 per rep. When you first try this exercise, initially emphasize the technique to get it right. Then try to increase your speed. Jason played at Boise State from 2001-2005. After a successful collegiate career, Jason played professionally from 2005-2014 with stints in Europe and the NBA Developmental League (Idaho Stampede), recording multiple championships and individual accolades along the way. Jason has trained with world-renown strength and conditioning coaches throughout his playing career. 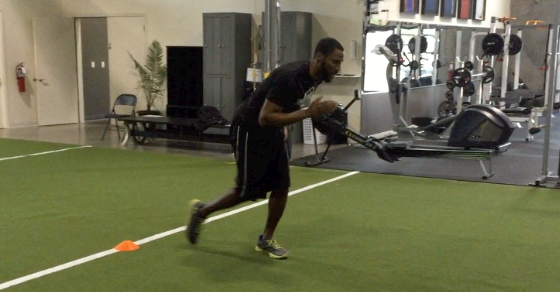 This passion has led to his post-basketball career as a Certified Personal Trainer (NCCPT). Rock and Armor Physical Therapy and Sports Performance, LLC offers a unique approach to athletic enhancement, fitness, and healing for active individuals of all ages. We are sports enthusiasts who believe fitness and healing should be fun, and occur in open spaces free from confinement. Our 8,000 SF facility allows athletes and active individuals to rehabilitate injuries in a setting that feels more like a gym, field, or court, and less like a doctor’s office.